From the city of Bodø, drive east on Hwy. 80 to Fauske, then south on E-6. The road leaves the fjord and heads south, climbing gently in Saltdalen. Locate the Storjordet on your left side. This is a national park center, there is also a Shell gas station with a large cafeteria and huts for rent. This location is about 1.5 kilometer before you get to the road fork where Hwy. 73 forks left and connects to Sweden. Immediately behind this center (access by road from the parking area (right side), there is a DNT self serve hut called Storjordstua, a very convenient starting point for this climb. This location is N66.81506, E015.40142, elevation about 109 meter. From the DNT hut, walk back (south) the access road, then left towards the river. Follow signs for Solvågtind, initially 10.5 kilometer. The trail immediately takes you across the river on a long, nice suspension bridge. Follow red marks to reach an old road, turn left here. Follow this road, completely flat, until a signed trail goes right. Shortly, this trail ascends to a very nice, old road that ascends the hillside. 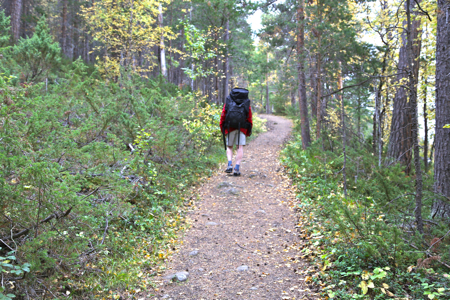 After a while, the sign for Solvågtind forks right, this is another short-cut trail that will merge with the wide path higher up. 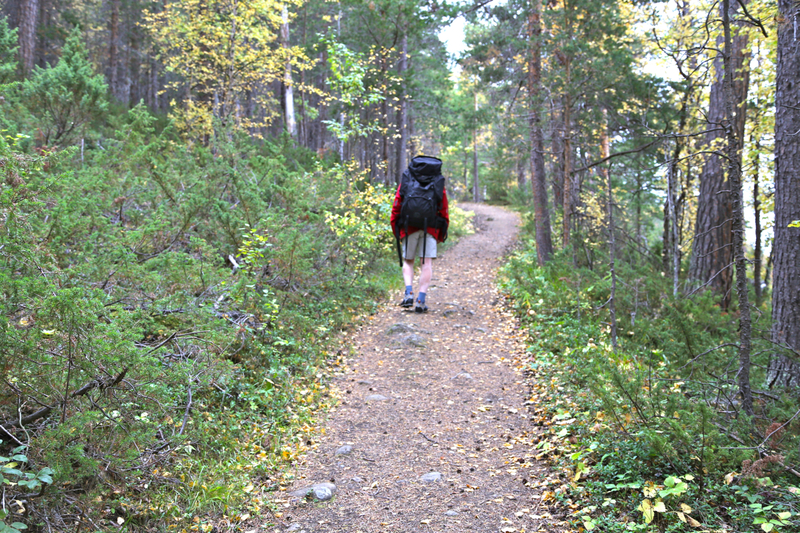 Eventually, the wide path turns into a normal trail as yet another sign for Solvågtind points uphill. Continue uphill through the birch forest and reach the treeline at location N66.82715, E015.4190, elevation about 675 meter. A clear trail continues uphill, however after crossing two small creeks it more or less dead-ends in a third creek. Better then to leave the trail near the second creek and head directly uphill on nice grassy slopes. 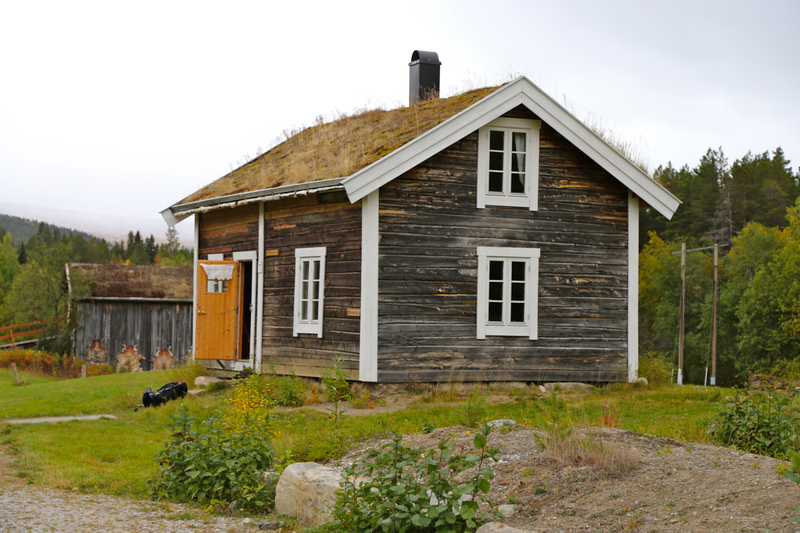 You may recover a faint trail on the horisontal plateau just below the cliffs of Solvågtind. In any case, follow below these cliffs to your left (when facing uphill), you will then find cairns that lead you to the correct (and easy) slope that gains the wide saddle with a small pond marked at 1290, just south of summit 1401. Cross this saddle to its east side (follow trail/cairns), then ascend along a pretty visible trail marked with cairns. The rest of this climb is quite easy as one gets near the cliffs before a final ascent along the ridge to a big summit cairn. The forecast called for a really rainy day, we decided to climb a nearby mountain with a trail. Solvågtind was sort of the obvious choice since the trail started directly at the doorstep of our DNT-hut. We started at 0850 and the weather seemed better than expected. The suspension bridge crossing the big river is quite nice and we were surprised to find this very nicely built trail/road (for horses ?) climbing the hillside. Higher up, we walked into fog and subsequently lost the trail by the creek. Not because of fog, but really more due the fact that the trail simply ended there. Ascending to the plateau below the upper cliffs, we first tried to ascend a bit early. This looked like a feasible route, but clearly not the tourist route. We turned back down and searched further along to find the correct route. Up in the broad saddle, we lost the trail again (possibly due to fog this time) and climbed the next slope in a rather inconvenient fashion. Hitting the trail at the top, we completed the climb along the very nice and easy last section, however, now we had strong gusts of wind and horizontal rain. 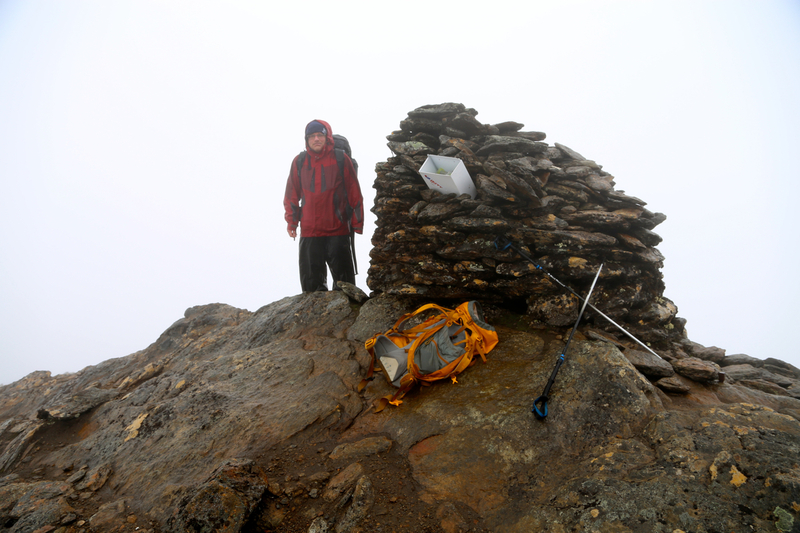 We arrived at the summit at 1200, stayed only 10 minutes, then headed back down - looking for more agreeable weather. Back at our hut by 1435, good use of a day that never showed a sign of being nice.